Yesterday BBC East Midlands published a story about Richard Shakespeare, a disabled man who spent hours on the floor of a hotel in Reading. It’s a troublesome thought, that a person using an accessible hotel room could find themselves in such a risky scenario, but it happened. In the article, it was reported that Richard, who has cerebral palsy, lost his balance while using his stick and fell to the floor. Thankfully, the emergency cord was within reach, and Richard pulled it. The alarm, however, did not work. Richard’s story is worrying, and it shouldn’t take incidents like these to justify emergency alarms. Those red cords you see in accessible toilets, changing rooms and hotels save lives, yet too few people understand why they exist at all. 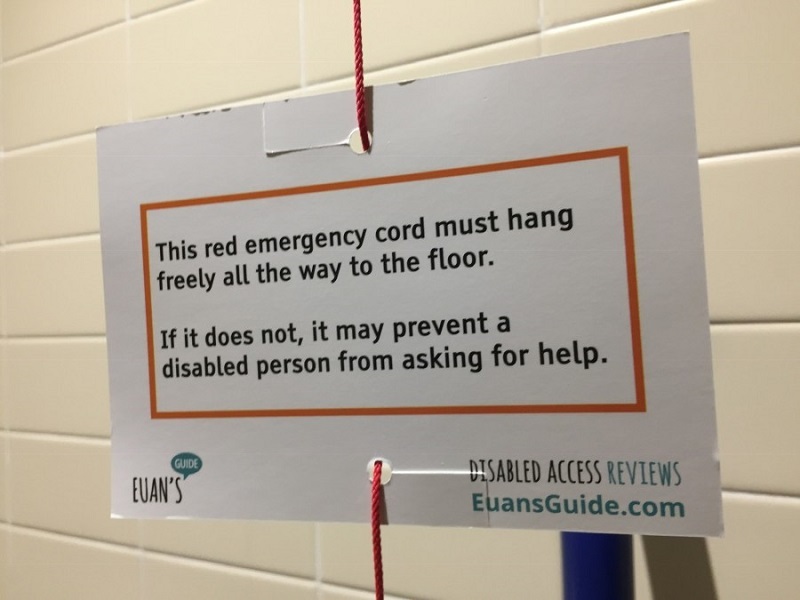 Determined to change this, disabled people have been using Euan’s Guide’s Red Cord Cards to help raise awareness and improve safety in public places. It’s the UK’s biggest guerrilla campaign to save disabled people’s lives, and so far it’s made over 30,000 of the country’s accessible toilets safer to use. Red Cord Cards are pocket-sized cards displaying a simple message: “This red emergency cord must hang freely all the way to the floor. If it does not, it may prevent a disabled person from asking for help.” They have been designed to easily attach to emergency alarms, or they can be handed to staff in public places when disabled people encounter a faulty alarm. Photo of a Red Cord Card sent to us by Lizzie. Accessible toilets aren’t just used by disabled people, they’re used by parents, cleaners, and non-disabled people too. Parents often move the cord to stop their child playing with it while being changed but forget to put it back. Cleaners sometimes tie cords up while they’re mopping, but don’t untie them again. If people knew they were putting lives at risk, would they behave differently? Emergency alarms are installed in places where disabled people are at increased risk of falling and are likely to be alone, such as transferring from their wheelchair to a toilet or getting into their hotel room bed. If the cord cannot be reached from the surface of the floor, a fallen person can be left stranded for hours. This is what happened to Richard, and his story shows that more needs to be done to make accessible spaces fit for purpose. In Richard’s case, staff awareness was negligible, and the alarm clearly hadn’t been tested in a while. Fire alarms are tested weekly and emergency alarms should be no different. Many disabled people who use Red Cord Cards also review the overall accessibility of places they’ve visited on Euan’s Guide. By adding access reviews to the site, they’re making it easier for disabled people to find great places to go. It also gives others an idea of what to expect before they visit somewhere new, such as whether there is an accessible toilet, ramp access, welcoming staff and more. Every review written on Euan’s Guide is returned to the venue meaning that every fault or issue raised by disabled people does not go unseen. You can request Red Cord Cards on our website or join in the discussion in our Facebook group or on Twitter and Instagram using #RedCordCard. If you’d like to make it easier for disabled people to find great places to go, please become a Euan’s Guide reviewer and share your experiences! Add your first review here.